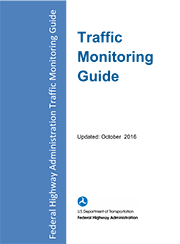 FHWA has released a 2016 edition of the Traffic Monitoring Guide (TMG) which provides the most up to date guidance to State highway agencies in the policies, standards, procedures, and equipment typically used in a traffic monitoring program. The TMG presents recommendations to help improve and advance current programs with a view towards the future of traffic monitoring and with consideration of recent transportation legislation resulting from the FAST Act. The needs for traffic data at both the Federal and State levels will continue to require that States have a well-designed traffic monitoring program to support all business areas. Traffic data and information is needed to assess current and past performance and to predict future performance. Improved traffic data, including data on ramps, is needed for reporting in the Highway Performance Monitoring System (HPMS) and there are now opportunities to utilize traffic data from Intelligent Transportation Systems (ITS) to support coordination of planning and operations functions at the Federal and State levels. For assistance coding the 2016 TMG nonmotorized station data please use the below referenced link. Note: For FHWA Travel Monitoring Analysis System (TMAS) Users. The current version of the FHWA Travel Monitoring Analysis System (TMAS) accepts the 2001 Traffic Monitoring Guide formats, which can be referenced from the documents listed below.